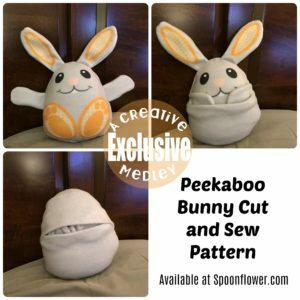 People have been asking for the Peekaboos as a sewing pattern for years, but the face is such a big part of it, I wasn’t sure how to do it. I have finally figured it out and I am so excited! I am now printing cut and sew patterns on Spoonflower. Peekaboo Bunny had to be the first, of course. You can find him on Spoonflower and Download the instructions here. I will be adding more as quickly as I am able to.